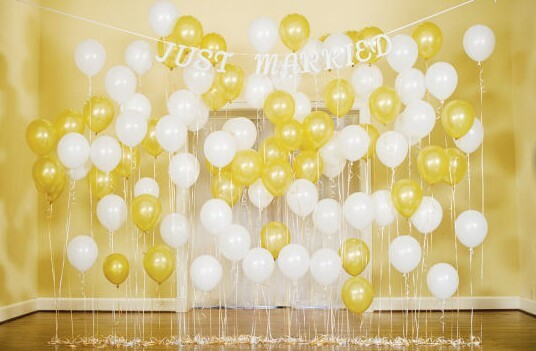 Create a backdrop by inflating balloons and tie each of them with ribbon and tape the ribbons to the floor in a line at varying heights! Follow the tutorial on the source to create this idea. See this idea using only white balloons. See this idea using various shades of pink balloons to create an ombre effect. See this idea using a variety of colored balloons. See a tutorial for this idea with the balloons embellished with sequins. See this idea with the balloons grouped together to form clouds and streamers attached to them.